I have seen Rush in concert many, many times but these last couple of shows in Chicago have been among their best. 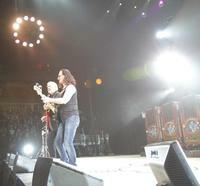 In 2010, Rush embarked on a tour that celebrated their Moving Pictures album and during those shows they played the whole record in order. The press that they received for that tour was so positive that they went ahead and took it to Europe. I have no idea why they are doing the same tour again in the states but I, for one, am ecstatic. This show is worth seeing multiple times. The second set started again with a funny video before the band launched into “Tom Sawyer.” As stated earlier, Rush performed the whole album from start to finish in order. Songs like “The Camera Eye” and “Vital Signs” don’t often get played and I don’t believe the former was performed since the original Moving Pictures tour. After that blast from the past, the band played the second of the new tracks “Caravan.” Like “BU2B,” it is very much like the material on Snakes & Arrows. Neil Peart’s drum solo was next and his is one of the very few solos that I feel are worthy of the time. He still adds the part at the end where he creates some big band music. If you have never seen Peart in concert, I recommend you catch his solo. Even though I’m there for the tunes, it still is a high point in each show. Alex Lifeson also got a little spot where he played a short acoustic solo before going into “Closer To The Heart.” That track had been dropped from the set list in recent years but it’s nice to hear it again. Before closing off the set with “Far Cry,” Lee and company launched into the first 2 parts of the “2112” saga. They could have ended the night right there, but they still weren’t done. Encores are always tricky because you want to play something that fans will want to hear but you also have try to capture that group of people that start to make their way to the parking lot. Rush don’t seem to have that problem. Almost all of the people stayed to the very end and they were rewarded with “La Villa Strangiato” and “Working Man”. Both tunes were reworked a bit. The former began in “German beer hall” band style while the latter was started in reggae style. It’s great that they changed these up a bit to keep it fresh for not only themselves but for the fans, too. If the movie intro were not enough, they also had a video outro that features Jason Segel. I hate to say that this is the tour to see Rush on because their next one might be even better but they will have a tough time topping this show.